A wonderfully-entertaining, fully-animated DVD with two complete Gigi stories for young girls - The Purple Ponies and Bursting With Readiness. 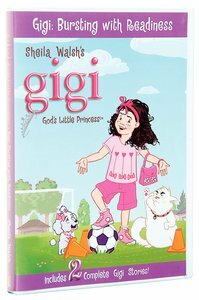 About "Bursting With Readiness (Gigi, God's Little Princess Series)"
A new, fully animated video with two complete Gigi stories! "The Purple Ponies" finds Gigi at a try-out for the soccer team with her best friend, Frances. This setting gives the perfect opportunity to learn that God has given us all different gifts-some may be great soccer players, while other do their best in other pursuits. "Bursting With Readiness" finds Princess Gigi wa-a-a-y out of her Princess zone while on an overnight church camping trip. Many "un-royal" activities follow her pinkness to the great outdoors-along with Frances, Will, Tiara, and Lord Fluffy. Also features a new, very princessy sing-along song! The Purple Ponies finds Gigi at a try-out for the soccer team with her best friend, Frances. This setting gives the perfect opportunity to learn that God has given us all different gifts?some may be great soccer players, while other do their best in other pursuits. Bursting With Readiness finds Princess Gigi wa-a-a-y out of her Princess zone while on an overnight church camping trip. Many "un-royal" activities follow her pinkness to the great outdoors?along with Frances, Will, Tiara, and Lord Fluffy. The fun activities and special lessons in this devotional storybook will make the Scriptures spring to life for any little daughter of the King of Kings. Ages 4-7. Unavailable. We are unsure when this item will be available to ship. Other edition is available. 023755415790 0 Available. Gigi starts off the Christmas season with a huge wishlist of pink and pretty things she wants. But there's only one gift that really matters at Christmas! Gigi's mum and dad help her to remember what that is, while still enjoying all the fun of Christmas time! Ages 4-7.